, queen of Scots, celebrated for her beauty, her wit, her learning, and her misfortunes, was born Dec. 8, 1542, and was the daughter and sole heiress of James the Fifth king of Scots, by Mary of Lorrain, his second queen, and dowager of Longueville. 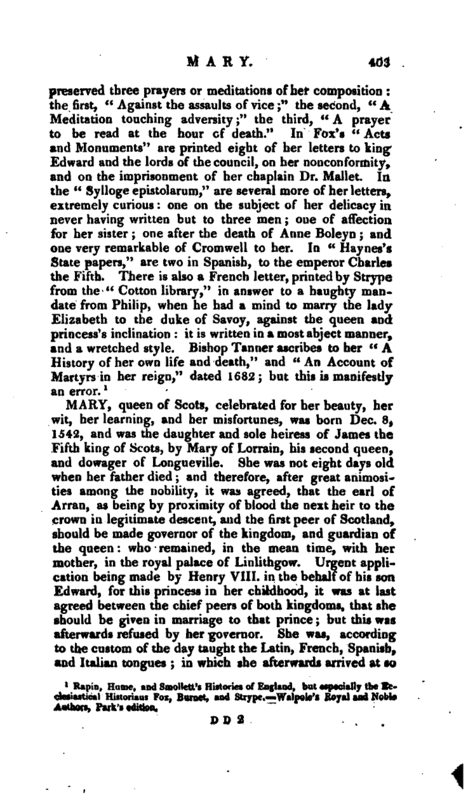 She was not eight days old when her father died; and therefore, after great animosities among the nobility, it was agreed, that the earl of Arran, as being by proximity of blood the next heir to the crown in legitimate descent, and the first peer of Scotland, should be made governor of the kingdom, and guardian of the queen: who remained, in the mean time, with her mother, in the royal palace of Linlithgow. Urgent application being made by Henry VIII. in the behalf of his son Edward, for this princess in her childhood, it was at last agreed between the chief peers of both kingdoms, that she should be given in marriage to that prince; but this was afterwards refused by her governor. She was, according to the custom of the day taught the Latin, French, Spanish, and Italian tongues; in which she afterwards arrived at so | great perfection, that few were found equal to her in any of them, and none superior in them all. The queen-mother being inclined to the interest of France, the young queen, by her care, was conveyed thither when but about six years old. After staying a few days with the king and queen at court, she was sent to a monastery, where the daughters of the chief nobility of the kingdom were educated. Here she spent her time in all the offices and duties of a monastic life; being constant in her devotions, and very observant of the discipline. 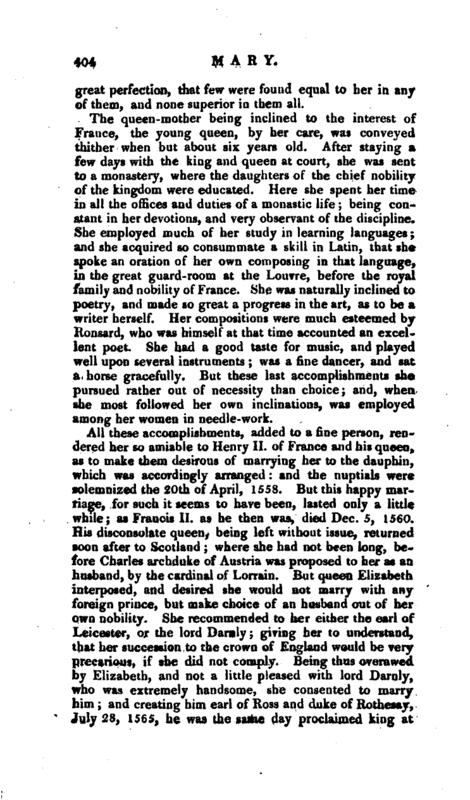 She employed much of her study in learning languages; and she acquired so consummate a skill in Latin, that she spoke an oration of her own composing in that language, in the great guard- room at the Louvre, before the royal family and nobility of France*. She was naturally inclined to poetry, and made so great a progress in the art, as to be a writer herself. Her compositions were much esteemed by Ronsard, who was himself at that time accounted an excellent poet. She had a good taste for music, and played well upon several instruments; was a fine dancer, and sab a horse gracefully. But these last accomplishments she pursued rather out of necessity than choice; and, when she most followed her own inclinations, was employe^ among her women in needle-work. All these accomplishments, added to a fine person, rendered her so amiable to Henry II. of France and his queen, as to make them desirous of marrying her to the dauphin, which was accordingly arranged: and the nuptials were solemnized the 20th of April, 1558. But this happy marriage, for such it seems to have been, lasted only a little while; as Francis II. as he then was, died Dec. 5, 1560. His disconsolate queen, being left without issue, returned soon after to Scotland; where she had not been long, before Charles archduke of Austria was proposed to her as an husband, by the cardinal of Lorrain. But queen Elizabeth interposed, and desired she would not marry with any foreign prince, but make choice of an husband out of her own nobility. She recommended to her either the earl of Leicester, or the lord Dandy; giving her to understand, -that her succession to the crown of England would be very pred&rious, if she did not comply. Being thus overawed by Elizabeth, and not a little pleased with lord Darnly, who was extremely handsome, she consented to marry him; and creating him earl of Ross and duke of Rothesay, July 28, 1565, he was the same day proclaimed king at | Edinburgh, and married to the queen the day after. By this husband she had one son, born at Edinburgh, June 19, 1566, who was afterwards James the Sixth of Scotland, and the First of England. Queen Elizabeth congratulated her upon this occasion; though, as Camden says, she inwardly grieved at being prevented by her rival in the honour of being a mother. She openly favoured her title to the succession; and the prince was commended to her majesty’s protection. In Feb. 1567, the new king of Scotland was murdered in a very barbarous manner, by the contrivance of the earl of Murray, who was the queen’s illegitimate brother; and, in May following she was married to John Hepburn, earl of Bothwell, a man of an ambitious temper and dissolute manners, and who in reality had been lord Darnly’s murderer. From this time a series of infelicities attended her to the end of her life. The different views and interests of the nobility, clergy, and gentry, in regard to religious and political affairs, had so broken the peace of the kingdom, that all things appeared in the greatest disorder and confusion. 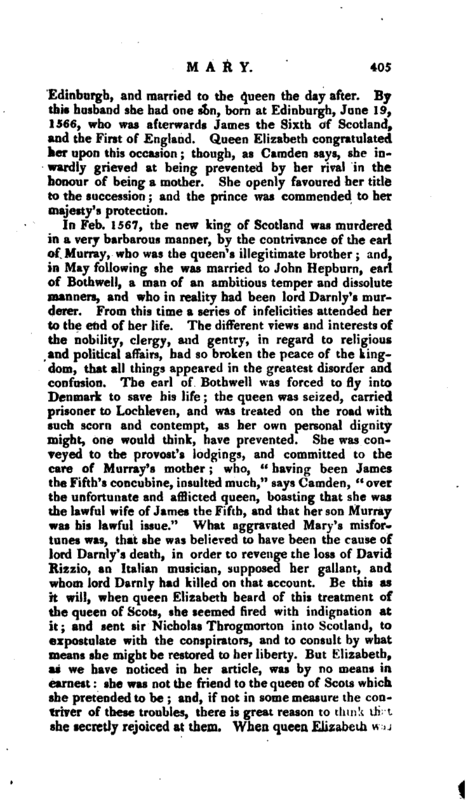 The earl of Bothwell was forced to fly into Denmark to save his life; the queen was seized, carried prisoner to Lochleven, and was treated on the road with such scorn and contempt, as her own personal dignity might, one would think, have prevented. 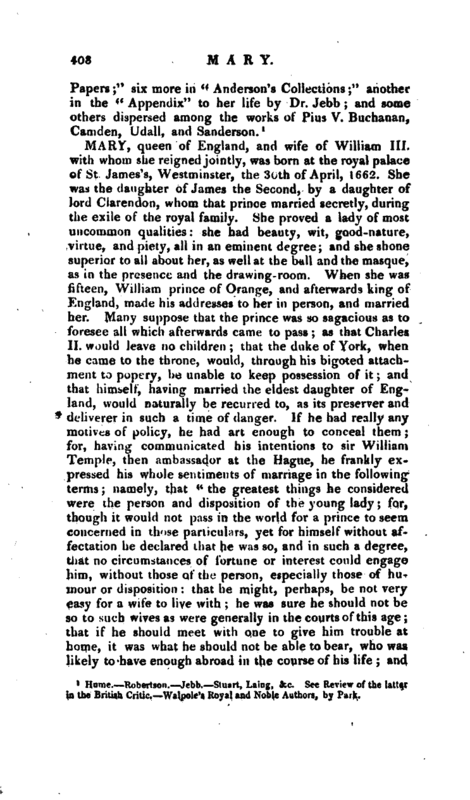 She was conveyed to the provost’s lodgiogs, and committed to the care of Murray’s mother; who, “having been James the Fifth’s concubine, insulted much,” says Camden, “over the unfortunate and afflicted =queen, boasting that she was the lawful wife of James the Fifth, and that her son Murray was his lawful issue.” What aggravated Mary’s misfortunes was, that she was believed to have been the cause of lord Darnly’s death, in order to revenge the loss of David Rizzio, an Italian musician, supposed her gallant, and whom lord Darnly had killed on that account. Be this as it will, when queen Elizabeth heard of this treatment of the queen of Scots, she seemed fired with indignation at it; and sent sir Nicholas Throgmorton into Scotland, to expostulate with the conspirators, and to consult by what means she might be restored to her liberty. But Elizabeth, as we have noticed in her article, was by no means in. earnest: she was not the friend to the queen of Scots which she pretended to be; and, if not in some measure the contriver of these troubles, there is great reason to think that she secretly rejoiced at them. When queen Elizabeth was | crowned, the queen of Scots had assumed the arms and title of the kingdom of England, 'an indignity Elizabeth could never forget, as not thinking herself quite safe while Mary harboured such pretensions. Having been detained a prisoner at Lochleven eleven months, and forced to comply with many demands which she conceived to be highly detrimental to her honour and interest, she escaped thence on May 2, 1568, to Hamiltoncastle. Here, in an assembly of many of the nobility, a declaration was drawn up, stating that the grants extorted from her majesty in prison, among which was a resignation of the crown, were actually void from the beginning: upon which such numbersof people came in to her assistance, that, within two or three days, she acquired an army of at least 6000. On the other side, Murray, with great expedition, made preparation to attack the queen’s forces before they became too formidable; and, when they joined battle, her majesty’s army consisting of raw soldiers, was soon defeated, and she obliged to save herself by flight, travelling in one day sixty miles, to the house of Maxwell lord Herris. Thence she dispatched a messenger to queen Elizabeth with a diamond, which she had formerly received from her, as a pledge of mutual amity; signifying, that she would come into England, and beg her assistance, if her rebellious subjects continued to persecute her any further. Elizabeth returned her a very kind answer, with large but not very sincere promises of doing her the most friendly offices. 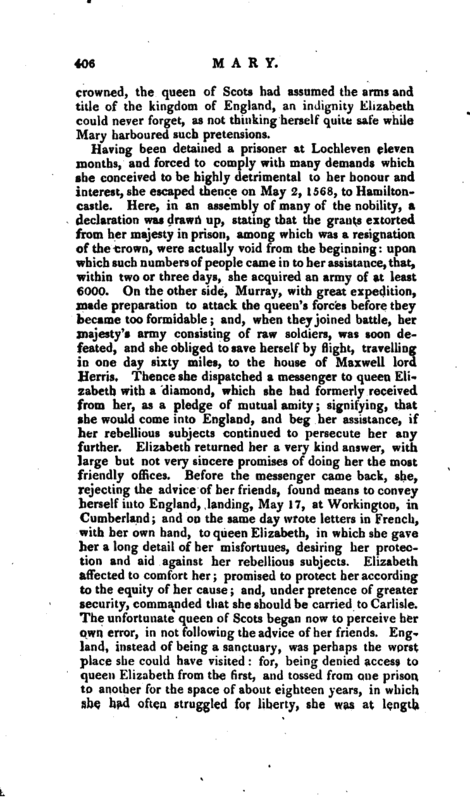 Before the messenger came back, she, rejecting the advice of her friends, found means to convey herself into England, landing, May 17, at Workington, in Cumberland; and on the same day wrote letters in French, with her own hand, to queen Elizabeth, in which she gave her a long detail of her misfortunes, desiring her protection and aid against her rebellious subjects. Elizabeth affected to comfort her; promised to protect her according to the equity of her cause; and, under pretence of greater security, commanded that she should be carried to Carlisle. The unfortunate queen of Scots began now to perceive her own error, in not following the advice of her friends. England, instead of being a sanctuary, was perhaps the worst place she could have visited: for, being denied access to queen Elizabeth from the first, and tossed from one prison to another for the space of about eighteen years, in which she had often struggled for liberty, she was at length | brought to trial, condemned, and beheaded, for being concerned in a conspiracy against the life of queen Elizabeth. She professed to die for the Romish religion, and has since been considered as a saint by that church. She was executed within the castle of Fotheringay, on Feb. 8, 1587, and interred, some time after, in the cathedral of Peterborough; but her remains were taken up afterwards by her son, and removed to a vault in Henry the Vllth’s chapel in Westminster-abbey, where a most magnificent monument was erected to her memory. 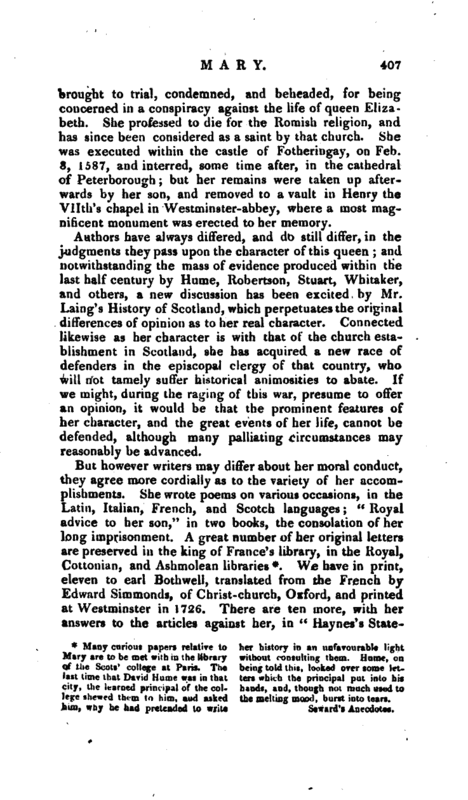 Authors have always differed, and do still differ, in the judgments they pass upon the character of this queen; and notwithstanding the mass of evidence produced within the last half century by Hume, Robertson, Stuart, Whitaker, and others, a new discussion has been excited by Mr. Laing’s History of Scotland, which perpetuates the original differences of opinion as to her real character. Connected likewise as her character is with that of the church establishment in Scotland, she has acquired a new race of defenders in the episcopal clergy of that country, who will not tamely suffer historical animosities to abate. If we might, during the raging of this war, presume to offer an opinion, it would be that the prominent features of her character, and the great events of her life, cannot be defended, although many palliating circumstances may reasonably be advanced. Many curious papers relative to Mary are to be met with in the library of the Scots’ college at Paris. The last time that David Hume was in that city, the learned principal of the college shewed them to him, and asked him, why he had pretended to write her history in an unfavourable light without consulting them. Hume, on being told this, looked over some letters which the principal put into his hands, and, though not much used to the melting mood, burst into tears, Seward’s Anecdotes. 1 Hume. Robertson. Jebb. Stuart, Laing, &c. See Review of the latter in the British Critic. Walpole’s Royal and Noble Authors, by Park.